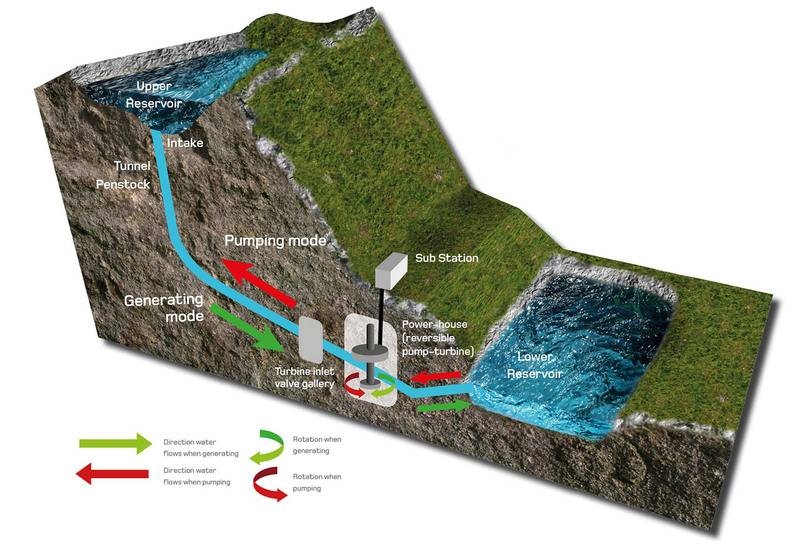 WHAT IS PUMPED STORAGE HYDRO? Pumped storage hydro has been used in the UK since the 1960s. The purpose of pumped storage hydro schemes is to store excess electricity that is generated from the UK’s baseload energy generation (such as nuclear and coal or gas power stations) and provide balance in the grid during periods of high demand as well as periods of excess supply. Excess energy is available typically at night when demand for electricity from the grid is low, and the baseload power stations take a longer time to reduce power from peak activity during the day; this is in addition to any intermittent energy available from renewable energy sources such as wind farms and solar parks. Water is pumped from a lower reservoir (or tailpond) to a higher reservoir (or headpond) using excess available energy. Once the water is stored in the headpond, it is then discharged through turbines when required to create electricity during times of peak demand. Pumped storage hydro has the potential to smooth out the peaks and troughs in our energy supply, a characteristic that will become increasingly important as the UK transitions from conventional energy generation to renewable and more intermittent technologies. Pumped storage hydro is currently the most efficient way of storing large amounts of electricity, and with short start-up times, it is one of the best technologies to help smooth fluctuations in the UK grid. The high-pressure tunnel connecting the headpond to the pump turbines. The low-pressure tunnel connecting the pump turbines to the outlet in the tailpond. The location where the underground headrace and tailrace enter the headpond and tailpond. Typically underground and contains the combined pump/turbines, generators, switchgear and transformers. This spillway will consist of a buried pipeline and is required to drain any excess water from the headpond as well as being used for the scouring and draining down of the headpond in an emergency situation.